The BestPack? 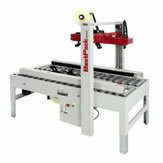 RS Series Semi-Automatic Random Tape Carton Sealers are built for speed and rugged dependability. The low profile feature allows for lower sealing capabilities. The RSL can tape boxes at a minimum height of 2" compared to the normal 4" height.